This book begins the publication of Jonathan Edwards's personal theological notebooks, called collectively the "Miscellanies." 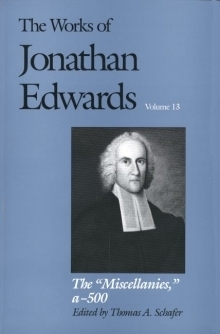 The entries in Volume 13 span the early years of Edwards's ministry, (1722-1731) and range widely in subject matter. They record Edwards's initial thoughts on some of his most characteristic ideas, such as original sin, free will, the Trinity and God's end in creation. However, many entries relate to doctrinal and polemical subjects not included in the corpus of Edwards's published writings. The volume also contains Edwards's own alphabetical index to the entire "Miscellanies"; this "Table" is a theological document in its own right that reveals the interrelationship among the various components of Edwards's theological system. The editor's introduction includes an interpretive essay that relates Edwards's growing body of entries in the "Miscellanies" to the main events in his life and progressing career. It also explores how even before the beginning of his tutorship at Yale in 1724 Edwards had developed both within and outside of the "Miscellanies" certain fundamental positions that constitute the truly distinctive elements in his theology. The introduction ends with an explanation of the methodology used to establish for the first time the chronology of the early miscellanies. The conclusions of this research are summarized in a comprehensive chronological chart that locates by date not only entry nos. a-500, but also the sermons, essays and other manuscripts Edwards composed prior to 1731. Thomas A. Schafer is professor of church history emeritus, McCormick Theological Seminary, Chicago.